When you work with ancient objects, new discoveries are often small: a fragment of a vase, for example, or half an earring. But Jeffrey Spier, the Getty Villa’s senior curator of antiquities, recently stumbled upon something much bigger. 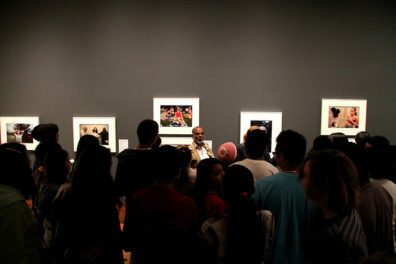 This past spring, Spier was in New York and dropped by a gallery in midtown Manhattan. While there, he turned around and noticed the marble head of a stern-looking older woman mounted on a pedestal by the wall. “I immediately thought: That’s the head!” recalls Spier. Decades of studying Greek and Roman art and a keen visual memory (an indispensible skill for any curator) snapped into place. Spier had just identified a carved marble head that had been mysteriously missing for decades from the body of the Getty’s 2,000-year-old Roman Statue of Draped Female. To most people, ancient classical sculptures probably look similar: remarkably graceful drapery, straight noses, perfect physiques. But as Spier explains, “Roman sculptors prided themselves in accurate and realistic portraits. Unlike the Greeks, they didn’t create idealized beauty. So once I saw a photograph of this sculpture’s missing head, I recognized it easily, the way you’d recognize a person you’d met before.” He laughed, “When I saw it I thought: Don’t I know you?” Spier took photos of the head on his phone and, when he returned to the Villa, shared them with his colleagues. All agreed that a fortuitous match had been made. The whereabouts of the Roman woman’s head had been a mystery for decades. The statue was acquired by the Getty in 1972 and is currently in storage. About a year ago, Spier and associate curator Jens Daehner began going through the artworks in storage to assess them for the Villa collection’s coming reinstallation (scheduled for 2018). The headless Statue of Draped Female proved intriguing to them, and with the help of provenance researchers Judith Barr and Nicole Budrovich, they found documentation that confirmed the statue did have its original head while on the art market in the early 20th century. Yet sometime between before 1972, as the 7-foot-tall lady circulated through several European collections, she was decapitated. Left: Archival photograph still of the statue with its head. Right: Statue of Draped Female (early 3rd century, Roman. Marble, H: 75 3/16 in. The J. Paul Getty Museum, 72.AA.153) awaiting restoration. But why? And by whom? Spier and his colleagues can only speculate on a motive: perhaps the neck partially broke in transit and then the owner decided to remove the head, or maybe a former owner felt they could make a larger profit selling two separate pieces rather than one tall statue. Whoever deprived this Roman woman of her head wasn’t particularly careful about it. Associate conservator Eduardo Sanchez is pretty convinced that the head was broken off intentionally by use of a power tool drill in combination with hard impacts to the front of the neck. When the head was brought to the Getty Villa, Sanchez and fellow associate conservator Jeff Maish created a lightweight replica of the broken neck surface to test its fit to the neck break on the body. The fit was inarguably perfect, except for some missing fragments in the front of the neck. This discovery brings to mind another “reunion” of ancient body parts. The famed Greek marble statue of Laocoön and His Sons (ca. between 27 BC and 68 AD) was unearthed in 1506 and installed at the Vatican in Rome. The statue was in surprisingly good condition but missing a few pieces. Four centuries after its discovery, in 1906, Laocoön’s missing right arm was found by an archeologist/curator among a group of marble statuary fragments in a builder’s yard in Rome. Previous conservators had guessed at the position of the missing arm and created a prosthetic (shown below at left). 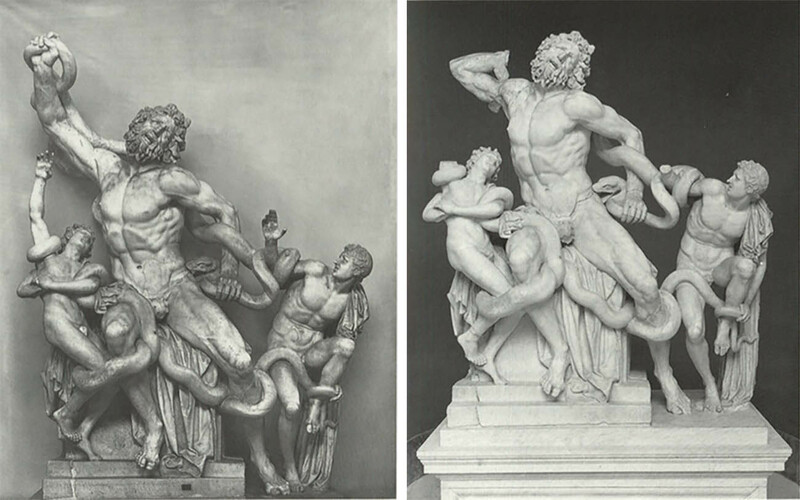 However, the discovery of the real arm proved the artist’s original intention, a physical pose which some argued increases the sense of pathos in Laocoön’s struggle. 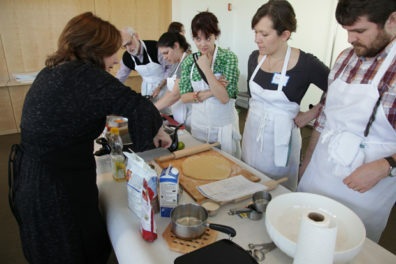 Left: Restoration (or “guess-toration”?) of upraised right arm. Right: Replacement of actual right arm found four centuries after the sculpture’s unearthing in 1506. Photos from Musei Vaticani, Archivio Fotografico no. VIII.5.23 (left) and no. XIII.10.21 (right). Source: Richard Brilliant, My Laocoön (Berkeley: University of California Press, 2000), pp. 2-3. 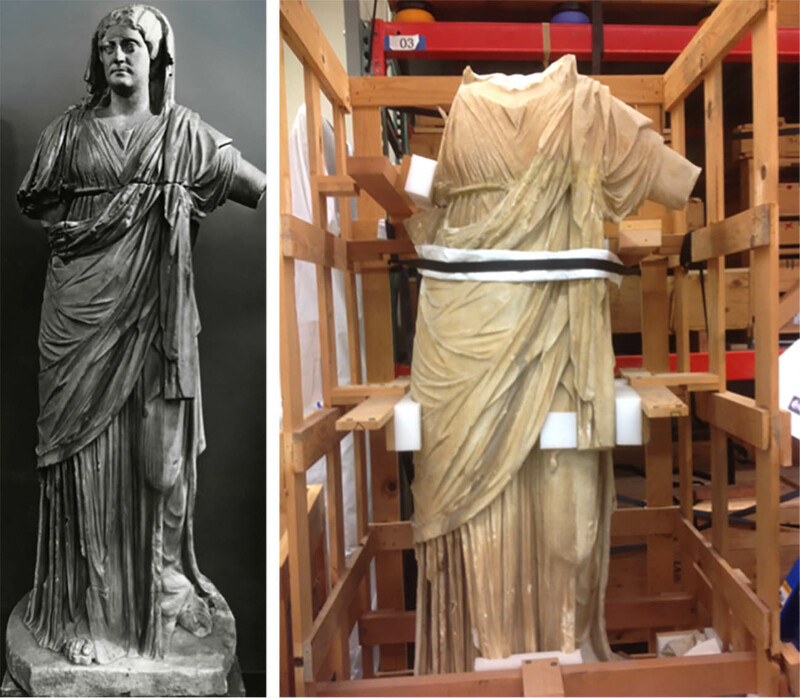 The restoration of the head to Statue of Draped Female may not add much drama to its interpretation, but now that we can see her face it does provoke questions about who she was. Spier assumes the Roman woman must have had significant wealth and status to have such a large statue made of her. She could have been a wife of a Roman emperor, whose portraits were often on coins—yes, a hunt through coins of the period is on. While the head and body are prepared for re-capitation (not a typical task for antiquities conservators) the Antiquities team is continuing to comb through 19th-century catalogues and travel guides in French, Italian, and Latin, trying to flesh out the details of the statue’s past, and to discover the identity of the Roman woman she was modeled after. It’s the plot for the Parent Trap with Jeffrey Spier as the twins and the lady and her head as the estranged parents who fall in love again. ADORABLE! Congratulations. What a spectacular accomplishment. Thanks. ARE you all sure that this one is the head of the sculpture? (If you cover her eyes and look only at the lower part, “her” lips are…male…and not female at all. 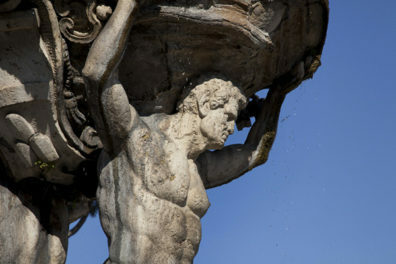 PS: The three a d d e d arms to the “Laocoon” group are also – and definitely – w r o n g – can nobody “see” (feel) this? Something similar happened to me in palm springs…when finding artifacts regarding J. Smeaton Chase and his writings in early California, I saw two photographs in an album and something struck me…I asked the curator if she could remove the two and low and behold, for decades, they had assumed they were two different photos but I put them together and low and behold, it was one photograph…sort of felt good about that..
A truly remarkable and fortuitous accomplishment. Congrats Mr. Spier on a brilliant sense of observation. Thanks for your interest! We do plan on documenting the conservation and “re-capitation.” Stay tuned! It is amazing; great work on recognizing the head. Look forward to seeing on display. Great! What a wonderful job! Congratulations Mr. Spiers. Fantastic. Like the good ending in a great book! 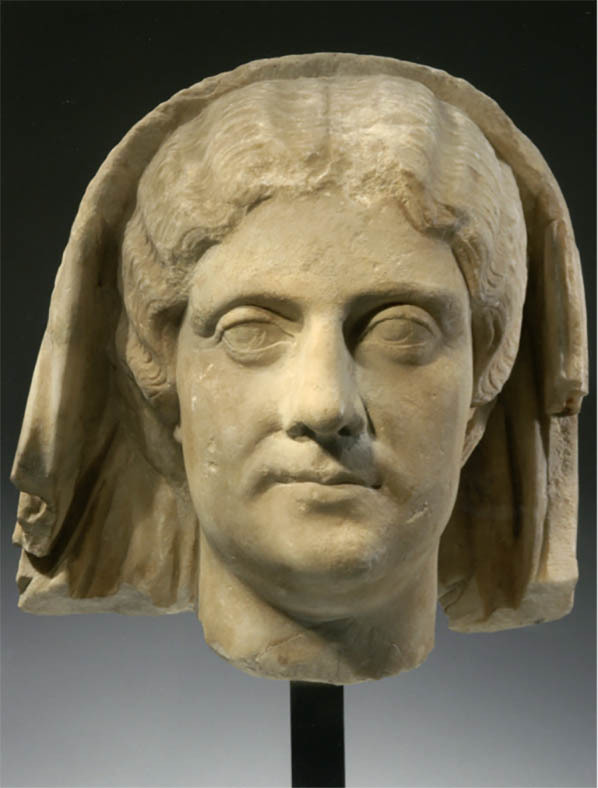 Royal Athena Galleries has this head catalogued as “Head of Faustina II, wife of emperor Marcus Aurelius”. Does the Getty not agree with this assessment? Wow! This is an amazing discovery! Great find! Congratulations!